There are more than a few issues to highlight in the latest installment of the Bourne franchise. The fact that they choose to set the final action set piece in Las Vegas. The all around pretty atrocious acting, from anyone who happens to step in front of the lens. The fake American accent on the part of Alicia Vikander, which is so bizarre it almost seems as if she’s trying to do some other, very subtle foreign accent instead. But at the end of the day, most of these could be forgiven as the shoddier execution we often expect with an action film. What can’t be, and what sinks the movie into the territory of the truly forgettable, is that the film completely fails to push the franchise along in any meaningful way. Instead, it acts as a sort of lazy greatest hits compilation, compiled with less energy and originality than most YouTube best-ofs. First, though, let me briefly try to defend the Bourne franchise as something interesting (or at least as something I find interesting). Admittedly, there are some problems with it. While it has stripped itself of most of the absurdly misogynistic qualities of the Bond franchise, it hasn’t really replaced them with much. And it arguably doesn’t really favor much better on the racial front, reeking of its own sort of Orientalism. But what made Bourne interesting (at least to me) was that it was such a fascinating and well-executed update of so many of the stale Bond (et al.) tropes. This, of course, really launched into being during the second installment, when Paul Greengrass stepped in. Suddenly we were seeing all of the elements and plot points of a Bond thriller but with a completely different aesthetic, a completely different rhythm, and a completely different feeling. What I think made Bourne especially exciting, though, was its updated morality and anxieties. Whereas Bond is in some ways about the power of the government as a good thing — look at these fancy cool gadgets the government has, look unbounded things a government agent can do (as long as he stays a secret) — Bourne is much more about the power of the government as a bad thing. Jason Bourne is government power gone too far. They’ve created something so dangerous and so powerful — and they’ve abused it so much — that they can no longer control it. 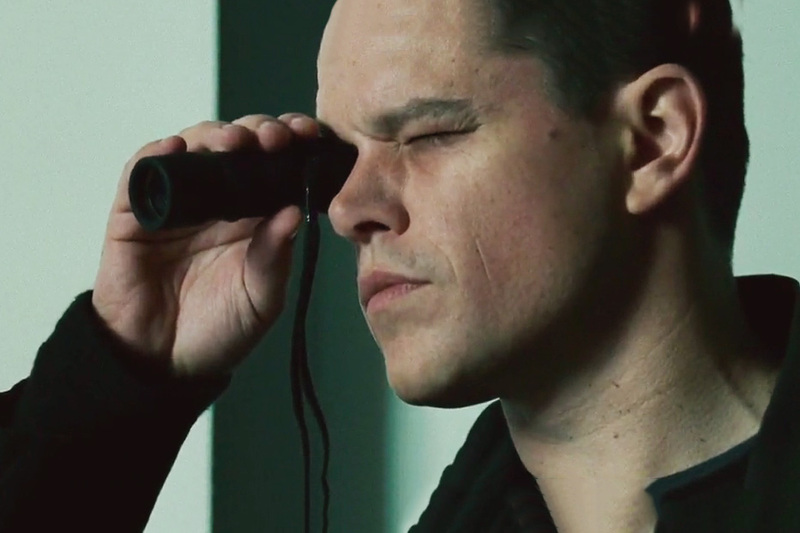 The unspoken question the character creates is what if Bourne wasn’t set on trying to discover his identity (and bring to justice those who have done wrong), but instead on something worse? The assumption is the government is out of control. A decade before Snowden, the series paints the ubiquity of government surveillance as a given. They hear everything, they see everything, they can manipulate anything. Undoubtedly, the series’s greatest achievement is its situation room pieces. Where else has this scene of modern warfare been captured so dramatically on screen? Its genius lies in the decision to pit Bourne — alone, defenseless on the ground — against the controller of the situation room — with seemingly limitless resources at her or her disposal. This is a new and exciting anxiety, one that resonates. When the tension shifts instead to Bourne and another agent on the ground (as it often does when an “asset” is put into play in the final act of some of the earlier films and for extensive sections of the latest installment) this drains the series of the novel anxiety. We’ve seen man vs man or superman vs superman time and again, this isn’t a question that holds much interest. What’s much more exciting instead is man vs modern government super-surveillance. How would we ourselves survive such a fight, we can’t help but wonder. Wisely, the series doesn’t try to answer this question by a sidekick or by fancy technology. Bourne (for the most part) works solo and his most powerful tools can be a book or a burner phone and a mono earpiece. It would be impossible (and unbelievable) for Bourne to outgun the technology of the control room so instead he must MacGyver his way out. All of which maybe means a few things. One: that Greengrass et al. should have just let sleeping dogs lie. The series was all in all great, they can re-run it for decades to come. If they didn’t have anything new to add they can leave it as it was. And/or two: that the novel anxiety the earlier films of the series so adroitly highlighted is no longer quite as resonant. Probably in part because it has become so ubiquitous. Were we to see on screen our government try to hunt down one of its civilians, we would likely expect it to be using the language and tools of these situation room scenes. Which means if the Bourne series isn’t going to try to put in the legwork to discover what that new anxiety is it should step aside and let someone else. We all know what happens if it doesn’t. It ends up like The World Is Not Enough. It isn’t pretty. This entry was posted in Critical. Bookmark the permalink.